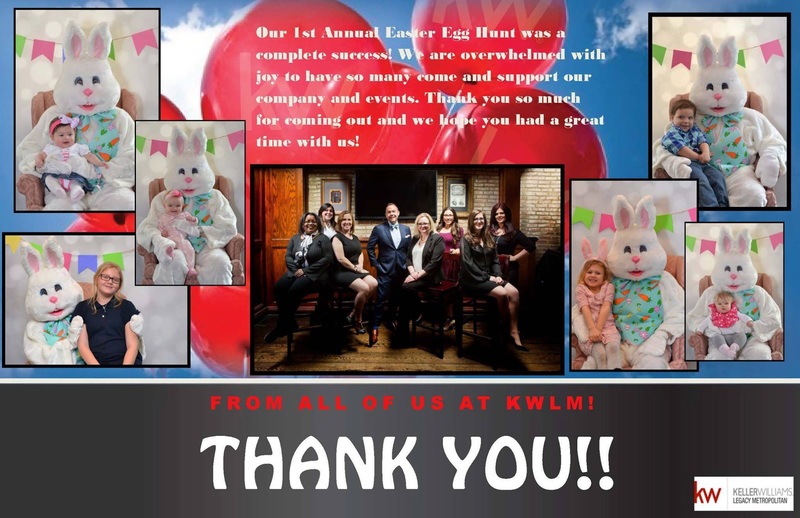 I recently wrote a blog post about our upcoming, 1st Annual Keller Williams Legacy Metropolitan Easter Egg Hunt. Our office and staff put this event together. This was a great way for all of us agents to connect and reach out to our past and current clients and have some fun! It was also a great way for our office and agents to reach out to the community in Canton, where our office is located. We didn't do to shabby! We had hundreds of people show up! It was a hit! Our office had pics with the Easter Bunny, Easter candy and all! Easter Eggs were hidden all throughout the office and everything. There were laughter and joy to be had by all, big kids and little kids! We did originally plan for our 1st Annual Easter Egg Hunt to be outside in the big park in front of our office. With the weather starting to become a little iffy, we brought it inside in case of rain! We (office agents) and staff invited our past clients and community! I'm pretty sure we will be doing this again it was such a hit! We would like to thank everyone for coming out and bringing their families, childrens and friends! There were so many laughs and cute photos! Really you could call it the cuteness overload event! I would like to thank Keller Williams Legacy Metropolitan Leadership and Staff for putting this together!!!! ➡️ And so much more!